Want to use for a bridal favor which is on June 20. Will I get a plant by then? Unfortunately it can take anywhere from 1 to 12 weeks to germinate. 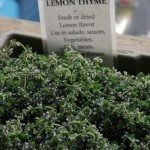 I would visit a local garden center and inquire about small starter herbs plants.